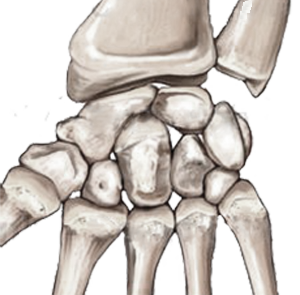 The wrist is a complex joint made up of eight small bones arranged in two rows between the bones in your forearm and the bones in your hand. Tough bands of ligament connect your wrist bones to each other and to your forearm bones and hand bones. Tendons attach muscles to bone. Wrist pain is often caused by sprains or fractures from sudden injuries. But wrist pain can also result from long-term problems, such as repetitive stress, arthritis and carpal tunnel syndrome. Because so many factors can lead to wrist pain, diagnosing the exact cause can sometimes be difficult. But an accurate diagnosis is essential for proper treatment.